MH-Z19 offset and scale differences!? I got two MH-Z19 with the latest ESPEasy version running side by side. One sensor is the "old" version, the other the "new". What may be the cause for the offset and scaling difference and which senor shows the correct values? Re: MH-Z19 offset and scale differences!? Most likely, the sensor with the lowest value has had Auto Baseline Calibration (ABC) enabled, which is the default. Then you keep the factory calibration active. In short, ABC does remember the lowest recorded value in the last 24h and then uses that as new 400 ppm baseline. You can 'restore' the old sensor by leaving ABC enabled (default value in ESP easy dev-12) and during the day do a lot of ventilation in that room. Then it will restore to a correct baseline. Only thing is, in a city you will probably never reach 400ppm, but something around 600-700 ppm. That difference will increase for higher concentrations of CO2. I will set both sensors to ABC enabled and let them sit outside for at least 24h to see if both output the same results afterwards. However i am a bit confused that both sensors reach the 400 ppm but after that they scale differently - not just offset but SCALE !? If the new sensor has not been running for 24h yet, I would suggest to disable ABC. Then you are using the factory calibration. And running outside is not the best way to reset the baseline. Internally the sensor stores its calibration value along with the temperature. Perhaps to compensate for something like humidity. The sensor will not output any value lower than 400 ppm (+/-a few ppm) So all sensors will eventually read 400 ppm, even when you are running them in a very bad ventilated room with some gas burners inside. If ABC is enabled, it will use the lowest reading in 24h and regard that as 400 ppm. So when still an option, disable ABC on the new sensor so you have at least one reading proper values. And about the scale, that's also perfectly explainable. As an example, consider the internal raw sensor value of 100 as "0" ppm. The factory calibration exposed the sensor to 400ppm CO2 concentration and that gives raw value of "200". Now you are reading "300" as raw value, which will output 800 ppm, because it is about 100 raw value increase per 400 ppm. With ABC enabled and bad ventilation, the sensor considers the lowest measured raw value of "300" as the new 400 ppm. So the sensor considers "200" raw points as 400 ppm. At some room concentration, both sensors with factory calibration and your other sensor with ABC enabled, both have "400" as raw reading. How would they output the value in ppm? The factory calibrated one will use 100 per 400 ppm and the other will use 200 per 400 ppm. Both have the "zero calibration level" at a raw value of 100. It is like a line through 2 points, the 0ppm CO2 point and the 400 ppm CO2 point. That will explain the offset scale, not constant offset. Last edited by TD-er on 04 Nov 2017, 20:04, edited 1 time in total. The ABC of the MH-Z19 is pretty weak. Only taking the last 24 hours into account. The S8 and it's siblings have a 3 week sampling period and only adjust a possible offset with a fraction of the difference. This makes it less influenced if it is used residential (i.e. people occupying the house more on weekends compared to offices etc.). Almost 24 hours passed since power up and placement outdoors. Am curiouse if calibration sets both sensors to the same level. Otherwise i am not sure what they are good for (except for making money). They are good enough for use in a room with good ventilation and occupation less than half that time (or at least enough time for the ventilation to purge the room). All sensors more or less deviate. In fact there is no "perfect" sensor, tolerances occur for a lot of reasons. See https://www.letscontrolit.com/wiki/inde ... d_Accuracy for some info about tolerances and calibration. The MH-z19 is a somewhat cheap sensor (below 20 EUR at Aliexpress). On top these sensors from china often are remakes done only with price in mind. There is a reason why good CO2-sensors are much more expensive. but don't expect reliable "µg/m³" values - the result will be disappointing. There's a reason why reliable and calibrated measuring devices are very expensive. Even these have tolerances, just lower ones. After 24h outdoors, both sensors have run a calibration cycle (see attachment). The sensors differ by approx. 38 ppm (452 vs. 414 ppm). Next, i will test if their values scale equally inside the house. 38 ppm equals 38 molecules out of 1 000 000 which is 0,0038% difference. So it's ok for that price tag. After 30 minutes inside the house, both sensors start to settle. The Version B at 832 ppm, the old Version at 615 ppm. I wonder if they did care a lot (or better... at all) calibrating the SCALE correctly at production? You should set the 400 base calibration in the same environment, as you normally use. Currently outside is humidity and temperature different from inside use. This will have impact on both sensors and both differently. You can let both sensors perform an automatic base calibration, but then please use the same interval. So power-up both at the same time (not reboot, power disconnect/connect) and let them run for several days inside the home. Please do not use the "perform base calibration" command via the URL too frequently. I managed to kill one sensor by running it multiple times within seconds. And only run that command with the sensor positioned in the room with proper ventilation (and no people/animals around). Easy answer: Calibrating is expensive - these sensors are cheap. The genuine MH-z19 and 19B made by Winsen have a tolerance of +/- (50ppm + 3% of the reading value). ( Datasheet: http://www.winsen-sensor.com/d/files/in ... ver1_0.pdf see page 4 ). So a deviation up to +/- 58 ppm per sensor at 600 ppm reading is normal. With two sensors compared you will have to expect tolerances up to about 120 ppm in that case. As almost all MH-Z i found on AliExpress are remakes produced only with price in mind - what can you expect? The only thing i'd expect is even more tolerance. You mean +/- 68 ppm. You mean up to 136 ppm. As mentioned before, they differ by approx. 217 ppm which is almost twize the worst case range, advertised in the DS. And statistically it's very unlikely that one sensor outputs the full negative tolerance at the same time the other sensor outputs the full positive tolerance range. So, yet another chinese temperature/humidity/any gas/any light/any supply voltage and so on by far overpriced random number generator ""sensor"". Well, depends on the purpose you use them for. For ventilation control they are sufficient. or you get a "Open the Windows" signal at a given threshhold, these sensors do that job. If you want exact metering you will have to pay really much more. needs a climate chamber with exactly controlled conditions. I don't think you'll find that at the small remake production sites in asia. But the problem being faced here is that the MH-Z19 sensor's baseline calibration will be affected by several parameters like temperature and humidity. Also the automatic base calibration seems to update only partially. It takes several days to reach the same level as the new sensor. That will set the current value to resemble 400 ppm. But please make sure you do not re-run that command within a short interval (e.g. within several seconds) or else you will reset the 0 ppm point. Please do not use the "perform base calibration" command via the URL too frequently. I did not know about that possibility yet. Can you give an example how to do it please? Found it myself.. calling "http://x.x.x.x/control?cmd=mhzCmdCalibrateZero" does the trick. I did a test over night comparing a MH-Z19, MH-Z19B and a Netatmo CO2 sensor. The MH-Z19B and the Netatmo correlate quite well, whereas the (old) MH-Z19 shows a negative offset although both MH-Z19 versions gone through ABC 3 times now with CO2 levels below 400 in between. What voltage are you using for the sensors? 3.3V or 5V? I know the MH-Z19 takes more time to performs the measurement when using a lower voltage. Perhaps this voltage-/timedifference also affects the accuracy? Both sensors run on clean, LDO stabilized 5V. 3.3V would not be possible anyway since the MH-Z19 needs at least 3.6V and the MH-Z19B 4.5V. They do work at 3.3V, but as I said, no idea about the impact on accuracy. Ignoring the minimum supply voltages specified in the datasheets is simply no good idea. LM1700, AM1117-3.3 or whatever similar is in the garbage bag of the manufacturer. These regulators need a bit of voltage for themselves to work correctly, the so called drop-out voltage. delivering constant voltage to CPU and the sensor itself. Even if the sensor is still running i won't trust any readings from that sensor. In the past few weeks, i had the opportunity to test several different CO2 sensors side by side. Each sensor (except the netatmo ofcourse) was connected to it's own ESP8266, all running the same ESPEasy firmware. The power-supplies used were also of same type. a) The Netatmo and the Senseair S8 Sensor correlated very well over time. Curves were quite smooth without significant correction-jumps. Measurements seem to be the most trustworth and comprehensible. b) Compared to the Natatmo and Sensair S8, the MH-Z19B measurements also correlate quite well over several hours. However auto calibration sometimes kicks in radically resulting in large jumps and constant offsets. Though, ventilating the room more often helps bringing the sensor back to plausible measurements after a while, it's not that reliable. In my oppinion, the Netatmo and Senseair S8 show a more advanced auto-calibration implementation. c) The old MH-Z19 version almost always measured too low CO2 values (compared to the Netatmo). Very seldomly a kind of base-line calibration was observed that raised the curve - however never that high to really correlate with the others. Find attached a diagram that shows the "most observed relation" of the sensor measurements. Please ignore the curve named "Senseair" since that sensor was somewhat misconfigured!! 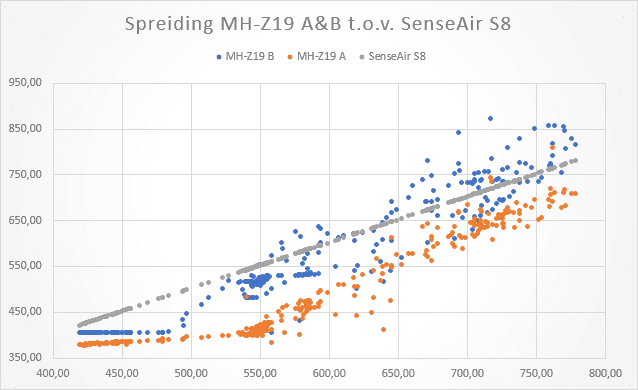 To come to a conclusion, my personal choice is absolute clearly the Senseair S8 because of it's good measurement continouity and flawless automatic baseline calibration. There is nothing worse than having a sensor that you can not rely on. However, if you REALLY can accept part-time offsets and jumps, then the MH-Z19B sensor is "ok" for it's price. If you run the latest version, you can disable the automatic base calibration of the MH-Z19. Already ordered few S8, but also have pair of MH-Z19 and pair of MH-Z19B. And my own tests are pretty the same as chunter1's! (for comparing 19 and 19B). MH-Z19 always shows ppm in about 200 less then MH-Z19B. Even after few days in well ventilated room. My plans currently (while waiting for S8) is to play with disabling ABC (with manual calibration) and again compare 4 sensors that I have ( I know that old MH-Z19 is crap). Welcome and I would love to see some graphs comparing the sensors side by side (like chunter1 did). All 4 sesnosrs installed on one breadboard (and its about 2cm between each of them). All powered from the same source. All transmitting data with similar Wemos D1 mini. 1) ABC does nothing in my environment (living room). Completely no difference for MH-Z19B with ABC and without ABC. 2) MH-Z19 always shows less PPM than MH-Z19B. Sometimes difference is very big (about 400-500ppm). When ABC is turned on, "U" continuously increases from 0 to about 37 000 when its self-calibrating (24h ABC period). When ABC is turned of, "U" always 0. 5) Boards with MH-Z19B has some problems with stability. They restarts in maximum 30 minutes (usually uptime is only 4-5 minutes). Boards with MH-Z19 does not have this problem and uptime is few days. With S8 I'll try to replace all boards to see if this helps. And I'll try to configure Syslog server to investigate this. Sensair S8 arrives in few days. I'll replace one of MH-Z19 with it and continue testing. BTW, does anyone knows, is it possible to connect multiple CO2 sensors to the one Wemos? Can you also write down what color in the graph what sensor is? About your last question. You can only add more than one when using different pins. The MHZ19 plugin uses the SoftSerial code, which allows multiple instances to be used. Also make sure your power supply is sufficient. These sensors may peak during a measurement. If all sensors peak at the same time, the voltage may drop due to resistance in the power cables, or even because the power supply may not deliver. One sensor may peak up to 150 mA if I'm correct. So 4 sensors may peak up to 600 mA. Also these sensors really should run on 5V, not 3.3V. I have several of these sensors here and they almost never reset themselves. Perhaps you should add some capacitors over the Vcc lines of the sensors. If the sensor reboots, it may affect the ABC functionality. The U value is believed to reflect the raw internal value reflecting the lowest concentration recorded in the last 24h. The sensor will consider this then as the new 400 ppm point. So if you did not ventilate enough, the lowest recorded concentration may actually be way above 400 ppm and thus the displayed value will be too low and may show hours of 400 ppm recorded values. Do you also have the values stored in some kind of CSV? Then you can create a scatter plot in Excel. Vertical is the concentration of all 3 sensors at the same time. So then you can see if the sensors agree (for example the S8 agrees very well with itself ) on a given concentration. If one may react faster or slower, the average should still be the same. One not to myself; I may have swapped the data from the A and the B sensor, since the A never gets below 400 ppm and the B version may give a bit lower values. 3) There are no problems with power supply. I've checked different power sources - no changes. 5) About CSV and scatter - good idea, I'll do that lately. I've started testing only 3 days ago and as I can see now - MH-Z19B (both versions) performs not bad. Max difference between all 3 sensors is only about 100ppm (max ppm was about 1600, min 400). BTW, I've paid 20$ for MH-Z19B and only 36$ for Sensair S8. As for now I thing it's fair price for both of them. When you reboot, could you test with the latest source to see if the problems with the Generic HTTP Advanced are now fixed? If you do the scatter plot, then you can see how well they correlate. And even 100 ppm off is not bad, as long as the average offset is close to 0. Some sensors may react slower, or faster to changes due to internal filtering. But that also means they will show a shift in time on rise and fall of the curve. However the rise of CO2 concentration may still be more steep than the fall of the concentration. For example when cooking on gas, the CO2 levels increase really fast, but they take more time to go back to lower levels, with people in the same room. Ok, I'll try to update to latest version. Currently MH-Z19B without ABC is very good correlated with S8 (with factory calibraion). Both MH-Z19Bs are reporting raw values, not sure if I need to change theirs filters. The filters I created are only making it less responsive. And the option "Use unstable readings" (or how it is called) does not have effect on the B version. Only on the A version. Updated all 3 boards to latest sources (manually compiled) - still has problems with one board (reboots every 10-15 minutes). All boards identical (wemos mini 3.0.0). Bought together. With Generic HTTP no problems. Logs are empty (with level 4). That looks quite nice, the scatter plot. So if you're running for a while, the version with ABC should show some drift and thus a wider band? Also interesting to "swap" the data by placing other sensors on the X-axis. Lowest ppm during last 24h was 600ppm. So MH-Z19B now thinks that this 600ppm is 400ppm... Terrible behavior. Yep, but mine is newer (1.3 vs 1.0) But I could not find any reasonable difference. Need to translate it somehow. I've finished with my tests (MH-Z19B vs SenseAir S8). So, finally MH-Z19B is very good with ABC turned OFF (and properly calibrated, of course). At the same time MH-Z19B very bad if you room not ventilated every day. Here is graph of two MH-Z19B (both with ABC turned OFF!) and one S8. Average difference (comparing to S8) is 1ppm and 10ppm.